Are you looking for a bigger pup? Some people say I look like a miniature cow, maybe part Dalmatian. My name is Missy (although my foster parents call me Missy Moo). 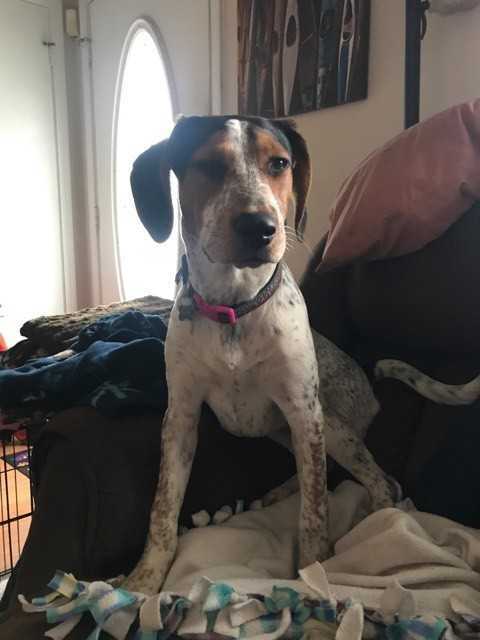 I am actually 1/2 Black and Tan Coonhound and part Labrador and Blue Healer, thus my gorgeous coloring and great personality. I am approximately 8 months old and although I’m a little bigger than most pups, I get along with all dogs. I am bigger than all of my foster siblings but I am very gentle with them. I will actually lay down and roll around on the ground to play with them. I love to snuggle my people although I can be a little timid at first. I would do best with another dog to help me build my confidence level. I love to go to day care to play with the bigger pups but I am a little afraid of the car. I am getting better while I am learning that the car takes me to fun places. I am a food hound and as such, treats are a great motivator as I learn my basic commands. I am house broken and know how to use a doggy door. I am also kennel trained and will go right in with motivation of a treat or food. I am very quiet in my kennel although I do not like to be in it when you are home (unless it is bedtime) and will cry to remind you that I am here or that I have to go potty. Keep in mind, I hear everything and I know when you you get home and will remind you that I am in a kennel as soon as I hear you. If you don’t want to kennel me at bedtime, that is okay with me! I will sleep in bed and cuddle with you all night. I am good with kids (I will sleep with them too), but keep in mind I am a bigger puppy and sometimes get excited to see them and might knock them over if they are small. I am up to date on my vaccinations, spayed, microchipped and heartworm negative. I am being fostered in the Kansas City area with an adoption fee of $250. My foster parents say they would keep me in a heartbeat but they know my perfect family is out there waiting for me. Are you my perfect family?